This Tuesday gone, I had the pleasure of finally meeting Chris Beckett at the really fun Sci Fi Showcase at Waterstones Tottenham Court Rd. You will be delighted to know, I was a total professional and properly geeked out. Beckett's writing is some of the finest I've the pleasure of reading recently. His Eden Trilogy (reviewed Here) is a remarkable achievement and his latest book, America City (reviewed Here), set on an environmentally challenged Earth a 100 years hence, is speculative fiction at the highest level and a rather uncomfortable reading. America City follows Holly Peacock, an English ex-pat living in Seattle with her husband Richard when her boss at the PR company where she works calls. Holly is asked to work with Senator Slaymaker on his ambitious plan to rehouse millions of displaced Southern Americans in Northern states. Slaymaker is a divisive politician. A self made man who built up his own haulage company and campaigned hard against automation and environmental taxes. Yet looking at his America, he now sees it on the brink and is determined to save it. With Holly on board his team, they set about using all the tools at her disposal to build support for the resettlement plan. AI’s creating chatter, real and fake news spun and the continuous manipulation of the conversation to achieve their goal. When things take an unexpected turn, they double down and work to unite the country by creating a new monster everyone can channel their fear towards. Three easy steps and you are into the hat. After reading America City, you may want to rethink that Twitter account, just be sure to give me a follow before you do! Full Terms and Conditions are below and all the best. 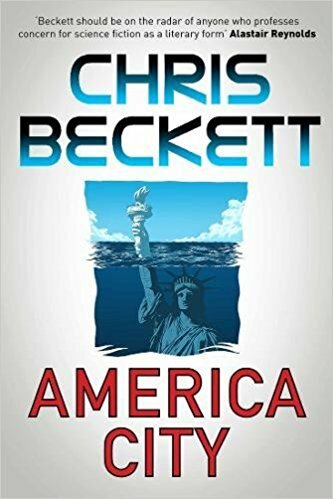 The Prize is ONE signed hardback copy of Chris Beckett's America City RRP £18.99. The Closing date is Wednesday 22nd November 2017 at 0759 GMT. The winner will be informed by Tweet and Twitter DM within 7 days of the competition closing on Wednesday 22nd November 2017 and will need to reply within 28 days or a new winner shall be chosen.